When in Shiraz, you may see Nazar Garden which is left from Zand Period. Nazar Garden was larger before and was dedicated to private royal occasions and official receptions. In 1934, it was converted to Pars Museum. You can see lots of archeological excavated articles from different periods. 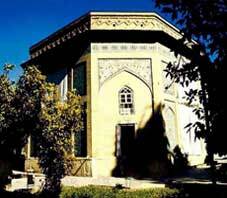 An octagonal building in the middle of garden, decorated with tile work and medallion paintings, made it similar to Hasht Behesht (seven paradises) Garden of Isfahan. The building consists of one large domed hall and four chambers. Karim Khan buried in the middle of the eastern chamber. Interior of building decorated with exquisite plaster work.